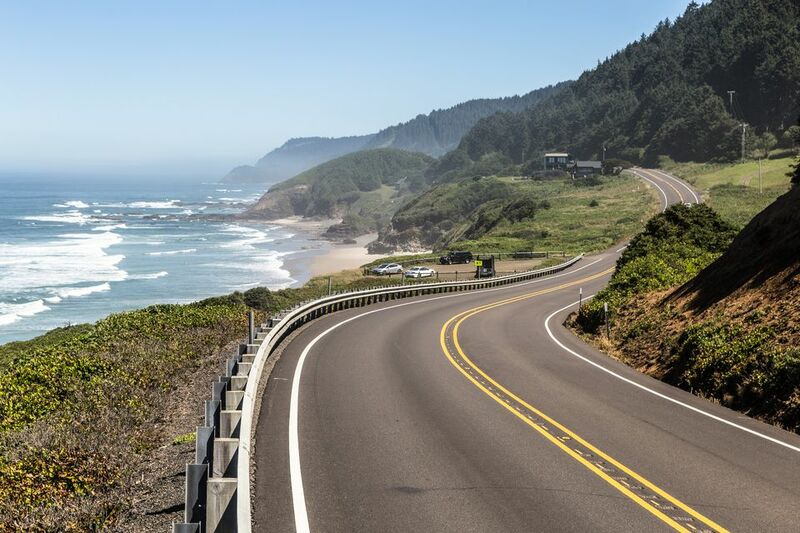 US Route 101 is one of the most historic highways in America. Stretching from Los Angeles, California north to the heart of Olympia, Washington, you're sure to see some of the most beautiful sites along the Pacific Coast highway. With more than 1500 miles to explore, there's something for everyone on this west coast adventure. There’s so much to do along the west coast when driving up and down the historic Route 101. Let's look at a few of the places to see and where to stay during your El Camino Real road trip through California, Oregon, and Washington states. The historic route was one of America’s first national highways and was first completed in 1926. It was intended to shuttle travelers along the entire west coast from its southern terminus in San Diego all the way up to Olympia, Washington; the current southern terminus is in Los Angeles, California. Though the highway was partially replaced by Interstate 5 and other modern roads, Route 101 is still frequently used by locals and tourists alike. The highway has made it into pop culture through songs, film, and even video games. Avenue of the Giants: Northern California - The aptly named Avenue of the Giants is a two-lane road that shuttles through a forest of Coast Redwoods. Though it is now designated as California State Route 254, the Avenue of the Giants is part of historical US Route 101 and runs parallel to the modern 101. The drive offers magnificent views of the historic redwoods and runs along the beautiful Eel River. There are many spots along the route where you can rest, picnic, or stop off to take a hike, bike ride, or even go for a swim. Ecola State Park: Cannon Beach, OR - Located off the 101, Ecola Beach is a must-see while traveling along the Oregon coastline. This famous park has some tremendous views of the nine miles of coastline, abandoned lighthouses, forests, coves, jetties and more. Lewis and Clark even traded with Native Americas for whale blubber in what would later become Ecola State Park. Clark said of the view, “…The grandest and most pleasing prospects which my eyes ever surveyed.” There are miles of trails which you can explore the park with. Make sure to get to the top of Tillamook Head for some of the best vista views. If you’re lucky you might spot some whales migrating across the coast. Olympic Peninsula Loop: Northwest Washington - This 330-mile loop ranked as one of National Geographic’s Drives of a Lifetime. You merge into the loop of the 101 and are soon transported to the unique world of northwestern Washington. Stop off for a hike in the Hoh Rainforest to take in views of the 300-foot-tall hemlocks or grab your binoculars to view flora and fauna in the national wildlife refuge near Grays Harbor. If you want to get the most out of the Olympic Peninsula Loop, leave yourself plenty of time for overnight camping, hiking and more, we recommend a week at the least. Here are my top three RV parks for some beautiful places to stop by for a few hours or a couple of days as you travel along the 101. Redwoods RV Resort: Crescent City, CA - Redwoods RV Resort is nestled right along US Route 101 and has all the modern amenities that RVers need like full utility hookups, laundry, and shower facilities on large RV pads. The park also has Wi-Fi, camping supplies, a pet park, and even a dog washing area. You are right on the doorstep of Redwood National Park, the Pacific coast, many state parks, and several other attractions. This park is perfect for traveling along the 101. Tillamook Bay Center RV Park: Tillamook, OR - The sleepy little town of Tillamook is located right off the 101 and is an excellent resting point to do some great sightseeing. The RV park itself has all the creature comforts you’ll need in full utility hookups, laundry and shower facilities, free cable, and Wi-Fi access. All sites also come with a picnic area, and fire pits are located throughout the campsite. Tillamook Bay Center RV Park is a great place to jump off to explore the Oregon coast including Ecola State Park, the Tillamook Forest Center, and the Three Capes Scenic Loop. If you want to stay indoors for a while and aren’t lactose intolerant, tour the Tillamook Cheese Factory or the Blue Heron Cheese Company. Forks 101 RV Park: Forks, WA - You’ll enjoy the town of Forks even if you haven’t heard of Twilight. Forks 101 RV Park is a small RV park with full hookups, shower, and laundry facilities and free Wi-Fi. The park also offers up a rec room, business center, picnic areas, grills, and on-site management. Forks 101 is conveniently located near grocery and hardware stores for restocking. Use Forks 101 as a jumping off point to explore the Olympic National Park and Forest. There are also plenty of rainforests, beaches, and capes to sight-see at. Of course, if you want to tap into your inner vampire, the town of Forks does provide Twilight tours. One of the best parts of any road trip is what you do along the way. Whether you decide to explore the entire 1500-mile stretch of Route 101 or parts of it, research the specific areas you’re in for more detailed guides on where to stay, what to do, and let adventure guide you.